Urban Jazz Coalition and The McConnell Arts Center invite you to join us for a magical evening of music featuring legendary jazz/fusion composer/keyboardist Jeff Lorber! One of the pioneers of the musical format known today as contemporary or smooth jazz, Jeff Lorber has been an icon for the fusion of Jazz, Pop, Funk, and R&B genres for more than three decades. 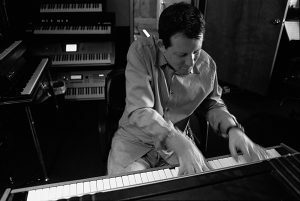 A Grammy nominated composer and artist, Jeff Lorber continues to break new ground with his signature combination of unique melodies, improvisation, and deep pocket grooves on his latest chart topping release, “Hacienda”. By the late 1970s, trailblazing keyboardist/composer/producer Jeff Lorber had become a prominent figure in the new movement known as jazz fusion – a marriage of traditional jazz with elements of rock, R&B, funk and other electrified sounds. Lorber and his band, the Jeff Lorber Fusion, first honed their craft in the Portland, Oregon, club scene and rapidly expanded their reach to a national and international audience via a combination of complex harmonies, unconventional time signatures and compelling rhythms. In subsequent years, Lorber dropped the term “fusion” from his billing as the movement evolved into what is currently known as contemporary jazz. Still, he continued to explore the innovative, improvisational potential of grafting other musical forms to the jazz idiom. Columbus’ own Urban Jazz Coalition will complete this dynamic musical package and perform their own eclectic blend of contemporary jazz, as well as music from their brand new ”Top 30? release, “One Step Closer”. Jeff Lorber…a true musical legend and the Urban Jazz Coalition…one of the hottest contemporary jazz groups in the USA.